The Exhale CO2 bag cultivates carbon dioxide 24 hours a day with no need to refill bottles or use expensive production units. Maintenance Free: No heat, No electricity, Just CO2. The CO2 bags work through photosynthesis – photosynthesis is the process by which plant leafs make carbohydrates. Sunlight, carbon dioxide and water are converted into carbohydrates and oxygen by the action of chlorophyll in the chloroplasts of the plant. Plants growing indoors under artificial light often lack enough CO2 to efficiently photo-synthesise. When plants are able to maximize the process of photosynthesis, the result is larger plants with larger yields. The power lies in the mycelial mass inside the vented cultivator. 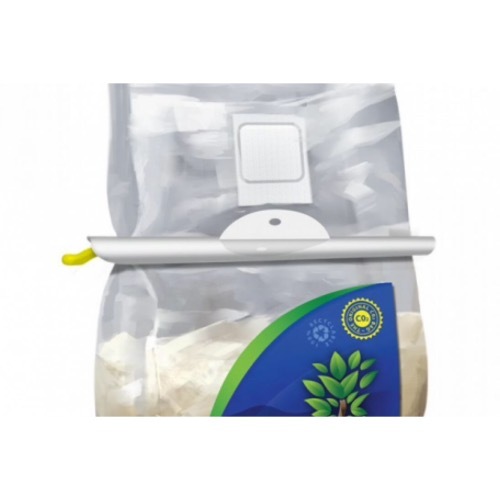 This mycelial mass cultivates carbon dioxide and the one-way breather patch releases CO2 continually for up to 6 months. The regular sized Exhale CO2 bag is designed for small to medium grow spaces, or more specifically 1 bag will provide 4-6 plants with the CO2 they need. It can be used for both vegetative plant growth as well as for fruit and flower production. 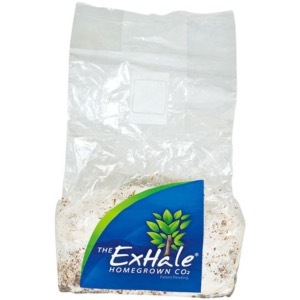 Exhale CO2 bags come complete and are cultivating carbon dioxide even before you get out of the checkout line. No need to turn it on or turn it off, simply place it in your grow space and leave it alone to do its job. A continuous shower of carbon dioxide directly onto your plants is the most efficient way to deliver CO2. Placing the bag slightly above the level of your plants will insure they receive the carbon dioxide they need 24 hours a day for up to 6 months. This is a revolution in your indoor carbon dioxide production systems. Place the Exhale CO2 bag slightly above the height of the plants in your grow space. Carbon dioxide being heavier than air will precipitate downward towards your plants. You will notice a change in appearance of the mycelial mass. Over time it will take on a whitish look which is normal. CO2 will continue to be produced for up to 6 months. Depending upon the conditions the bag may inflate, however this is not an indication of performance. If the mycelium is growing the CO2 is flowing. The bag is 100% recyclable. Simply remove the contents and mix into your compost pile or use as a soil amendment. The bag can be recycled through your local plastic recycler.